Should you tire at last of history's treasures, Jordan's desert vistas and marine life will help you to fill the idle hours. 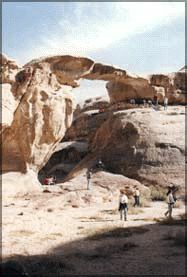 Trek or climb in Wadi Rum, a mauve hued valley of mesmerizing beauty where Lawrence of Arabia once rode. Try hot air ballooning over the hills and canyons, or spend a night under the stars in Bedouin tent. 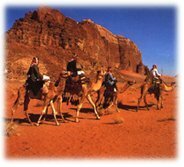 Feel the romance of the Arabian desert in the spring time ... or any time, at Wadi Rum in Jordan. Let the fabled T. E. Lawrence come alive, where through memories stirred from the screen version or from the pages of history and the actual exploits of the legendary British officer. Wadi Rum is like the moon scope of ancient valleys and towering weathered sandstone mountains rising out of the white and pink colored sands. Much of David Lean's "Lawrence of Arabia" was filmed there and and it was also the location where T. E. Lawrence himself was based during the Arab Revolt. Today Wadi Rum challenges climbers to scale its sheer granite and sandstone cliffs, to hike along mountain trails and valleys, to trek deep into the enchanting landscape in four wheel drive vehicles, or to join tow or three day desert safaris on camel back or 4x4 vehicles.